No, we haven’t won a Silver Medal for our wine – which doesn’t really come as a shock as we haven’t entered any competitions for a few years, rightly or wrongly. 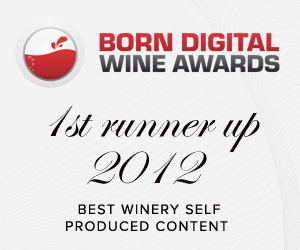 But I’m chuffed to have won a brand new Kindle and a year’s subscription to jancisrobinson.com for coming in as ‘1st Runner-up’ in the 2012 Born Digital Wine Awards in the Best Winery Content category. Much of this chuffness stems from there being such a stellar bunch of wine writers on the judging panel, including Jancis Robinson, Tim Atkin, Elin McCoy, Wink Lorch and Richard Ross. Congratulations to the odds-on favourite in this category, Ryan O’Connell of O’Vineyards, for his blog post entitled Who Visits Vineyards? Ryan’s piece, and the subsequent comments, has given us food for thought when it comes to our vineyard tours. The full list of winners and runners-up, with links to the articles, can be seen here.